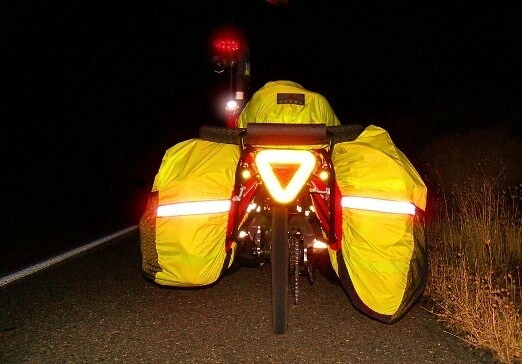 Beginning with my first overland trike journey in 2009, I have used the Arkel pannier system as my main cargo solution. 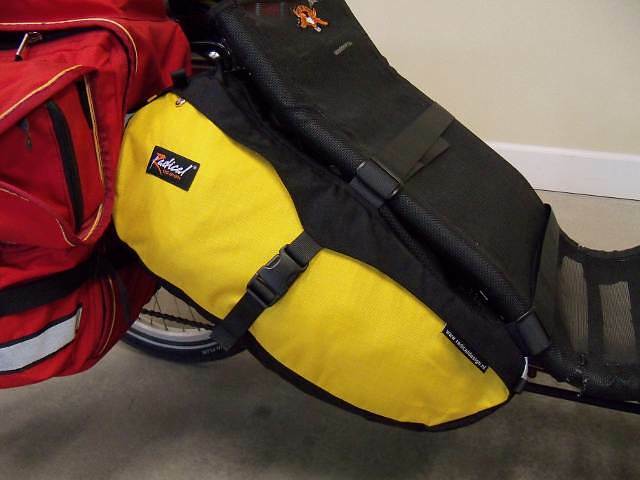 Currently, I use the Arkel TailRider trunk that sits atop my rear rack, and the Arkel GT-54 panniers, which are placed on each side of the rear rack, next to the rear wheel. In addition, I use the Radical Design side seat pods to fill the triangular void that is formed behind the pilot’s seat. I have found these cargo solutions to be top notch. Arkel products are made in Canada, and Radical Design products are made in the Netherlands. The Arkel TailRider trunk has a maximum volume of 11 liters, as it is expandable when more items are placed inside. The Arkel GT-54 panniers have a total volume between the two of 54 liters. The Radical Design side seat pods have a total volume between the two of 25 liters. Thus, when taken as a unit, my cargo volume is 90 liters, which is sufficient for an experienced overland triker who has refined his cargo paradigm over the course of a couple extended trips. Notice the long tube sticking up on the right side GT-54 pannier. 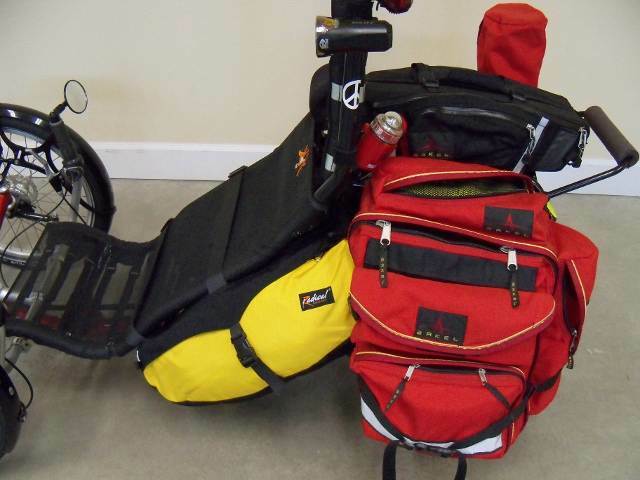 Recently, in preparation for my 2013 Pacific Coast Tricycle Adventure (PCTA), I have modified the right hand side GT-54 pannier, and I will relate the details here. On a standard right side GT-54, there is a long tube that attaches vertically to the rear of the bag. This has been a necessary part of the bag for many years, as it held the traditional ThemaRest sleeping pad when rolled up, along with the long tent poles common on many tents. The typical sleeping pads and tent poles would not fit anywhere else in a convenient manner without having to be strapped on externally, which was not a good option, so Arkel designed the long tube to answer this cycling need. 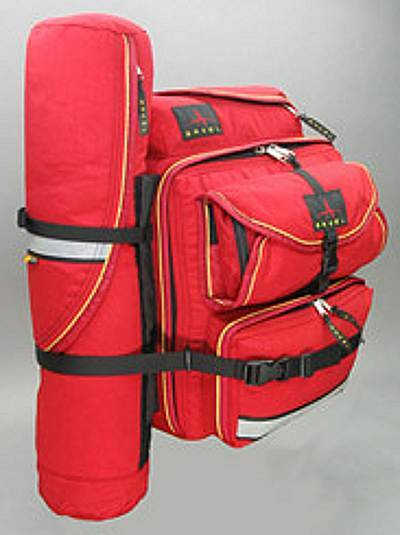 The Arkel GT-54 right side pannier with long red tube for tent poles and rolled sleep pads. Well, as things always do, products have evolved over the years, and now I have found that the long tube is absolutely unnecessary. 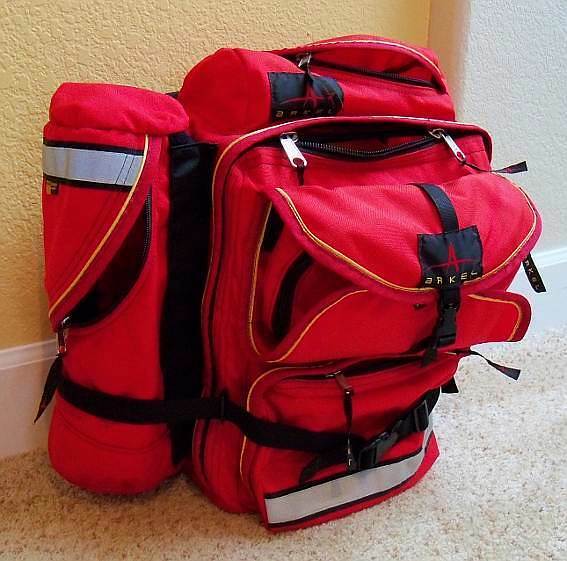 In an effort to greatly reduce my overall cargo load, both with respect to volume of space necessary to pack it, and the weight of the gear, I have evolved into using products that are much lighter and much smaller. As a result, that long awkward tube had to go, or, in my case at least, had to be redesigned and modified to meet my current overland triking needs. The tube has always been removable, held on by huge velcro strips, so I removed it from the bag and had some professional surgery performed on it. 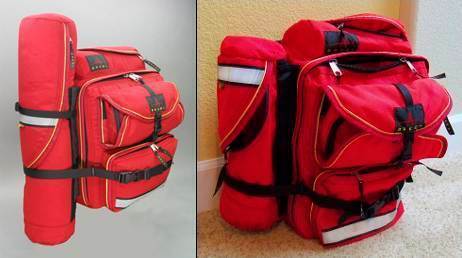 My solution to streamlining the setup began by shortening the tube, as can be seen in the accompanying photographs, thereby reducing my GT-54 total volume by about 2 liters, so now my GT-54 bags are actually GT-52 bags, roughly 52 liters of cargo volume. But that is fine because as I refine my packing strategies, this is plenty of space for all my gear. Why have I done this? With the shortened red tube, the GT-54 system now becomes a GT-52 system. I now use a NEMO Obi one person tent, which has a single pole array that folds down very short, and thus can fit anywhere, and I also use the ThermaRest NeoAir Fast ‘n Light sleeping pad, which instead of rolling to a large size, folds down to a very manageable size of 7x4x1.5 inches. Compared to the old ThermaRest sleeping pads that rolled up to a size of 7×20 inches, this new product is superior. It is also superior in sleeping comfort, providing a luxurious 2.5 inches of inflated cushion for my weary triker’s body each night. The old traditional ThermRest pads pale by comparison! The extra money spent for the new pad is well worth every penny. 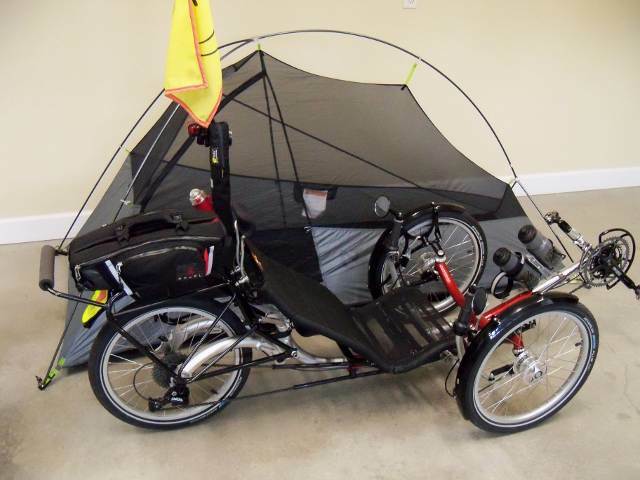 The tent, poles, sleeping pad, and sleeping bag are all placed in my Radical Design side seat pods, meaning that my house and bed are stored along side my reclined trike seat, thereby rendering the long rear tube obsolete. There is another aspect to the long tube as it was, and that is when the yellow, high visibility rain covers are placed on the bag, the tube scrunches forward, looking rather bulky, giving the appearance the bag is way overpacked. 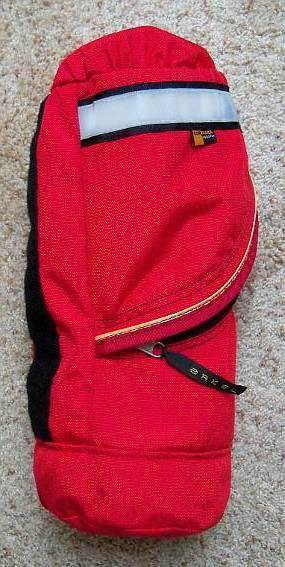 The right side rain cover was made extra large to accommodate this long tube, thus since I have shortened the tube, I had to order a left hand side GT-54 rain cover to place on the newly resized right hand side bag – the old rain cover is simply too large and baggy to use now on the modified pannier. I run the high visibility yellow rain covers on all my Arkel bags even in the sunshine, as it increases the safety factor by a huge order of magnitude – I stand out like the proverbial “sore thumb” in the eyes of petroleum powered humans. My Radical Design side seat pods also have high visibility yellow side inserts, so I am awash in a sea of yellow, a trick I learned well from fellow trike gypsy Gary Bunting (the Yellow Beast Triker). The Radical Design bags from Holland sport yellow inserts for maximizing visibility. Keep in mind that if you still are using the older technology of long unwieldy tent poles and bulky roll-up sleeping pads, the modification I am describing here will not be something you wish to do, as you will need to keep that long tube to hold your poles and sleeping pad. But, if you advance to the newer technologies that incorporate space saving and efficient tent poles, along with the far more comfortable and compact sleeping pads, you may wish to consider shortening the pole/pad tube as shown here. To do this job, I hired the lady who performs all the gear repair and modification work for REI of Eugene, Oregon, the second largest city in the state. Marina knows her stuff, and is kept very busy year round by referrals from REI. When she does a job of repair or modification for your outdoor gear, it is always a thing of beauty, and the result looks like it came from the original factory. Actually, sometimes her modifications or repairs exceed factory appearance and specs, and you end up with a product that is superior to what you originally had. And the unbelievable part is that her prices are very modest for what you get in return. For this job of shortening the tube, she charged me $32. Arkel could not have done it any better. Her business is called Marina’s Stitch in Time, and here is how she advertises it: – Zippers, Alterations, Repairs & Custom Sewing – Specializing in outdoor gear – Gear pick-up from REI on Fridays – Most repairs returned the following Friday. Her telephone is 1-541-343-3050, and she is open Monday through Friday from 10:00 to 2:00 for calls (the other hours she is always busy, either working on gear for folks, or tending to her garden). I realize most of you do not live in the Eugene, Oregon area, but her counterparts can be located anyplace on Earth where there are serious outdoor adventure stores like REI. I also had Marina modify my Radical Design side seat pods, as described in a former article I have posted on Trike Asylum. So now I have ended up with what is essentially a pair of Arkel GT-52 panniers, which give a compact look on both sides, without the ungainly long tube sticking way up above and hanging way down towards the pavement. The long tube doesn’t look too bad on a bicycle, which is what the original GT-54 panniers were designed for, but since my ICE Qnt recumbent tadpole trike sits so low to the ground, it always appeared that the tube was about to drag on the ground, almost like the right side pannier was severely overloaded and tipping the trike towards that side. Now however, it’s a clean and symmetrical appearance, using the same size rain cover on each side. And the good news is that losing that 2 liters of cargo volume from the shortening of the tube allowed me the perfect excuse to further refine my packing paradigm to bring less gear – remember, on an overland trike journey, less is always more … better! Stay light – Pedal far – Have fun! Notice how the old GT-54 tube extends far below the level of the left side pannier – no more!